Everyone loves trivia about the place they call home. Here are some interesting numbers and tidbits about Catoosa County. Size: Catoosa County is 162 square miles, tied with Barrow County as the eighth smallest out of the 159 counties in Georgia. Age: Catoosa County was established in 1853, the same year as Webster, Hart, Pickens, Dougherty, Fulton and Worth counties. Seventy-eight counties are older than Catoosa. Interesting aside: Before the establishment of charter counties in Georgia in 1777, the state had parishes, like Louisiana. Population: Only 35 counties in Georgia have more residents than Catoosa, which has around 66,000 people. Density: Only 20 counties in the state are more densely populated than Catoosa, which has 401 people per square mile. By comparison, Walker County has 152 residents per square mile. Clinch County, the least dense, has eight and DeKalb County, the densest, has 2,638. Borders: Catoosa County borders two other Georgia counties — Walker and Whitfield, and one state, Tennessee. By contrast, Walker County borders six Georgia counties and two states. Age of residents: 39.7 years old and getting older. Estimates say we'll average 40.4 years old by 2021. Work: As of 2014, 4,309 Catoosa residents both lived and worked in the county. 20,277 lived in the county but worked elsewhere, and 8,972 people lived outside the county but came here to work. Schools: The Catoosa County Public School System has just over 10,400 students and 18 schools. Finally, what are the top courses students study in the technical colleges of the area? In order of popularity, Welding Technology, Business Administration and Management, Industrial Mechanics and Maintenance Technology, Automotive Mechanics Technology, and Health Services. Catoosa County officials have hired KCP Engineers to design the new fire station, the same firm that did the design for renovations of Fire Station 3 in the Graysville area. Catoosa County Fire Chief Randy Camp (left) discusses plans for a new fire station in the Woodstation area off Alabama Highway during the Sept. 4 Catoosa County Board of Commissioner's meeting. Catoosa County Attorney Clifton "Skip" Patty discusses the specifics of the agreement for architectural services during the Sept. 18 Catoosa County Board of Commissioner's meeting. 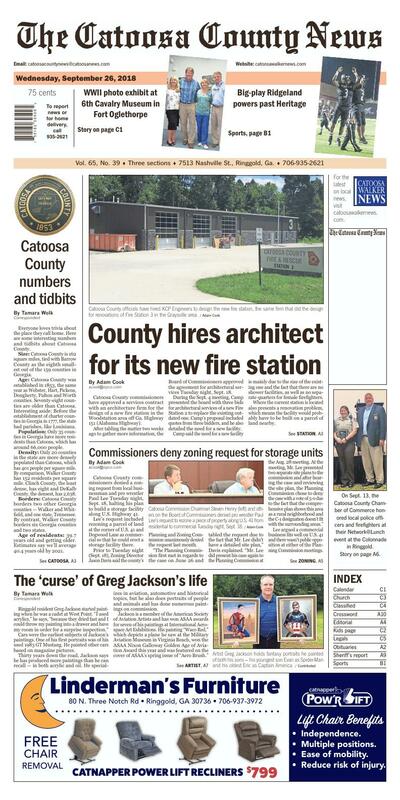 Catoosa County commissioners have approved a services contract with an architecture firm for the design of a new fire station in the Woodstation area off Ga. Highway 151 (Alabama Highway). After tabling the matter two weeks ago to gather more information, the Board of Commissioners approved the agreement for architectural services Tuesday night, Sept. 18. During the Sept. 4 meeting, Camp presented the board with three bids for architectural services of a new Fire Station 2 to replace the existing outdated one. Camp's proposal included quotes from three bidders, and he also detailed the need for a new facility. Camp said the need for a new facility is mainly due to the size of the existing one and the fact that there are no shower facilities, as well as no separate quarters for female firefighters. Where the current station is located also presents a renovation problem, which means the facility would probably have to be built on a parcel of land nearby. "Were landlocked, so adding onto it would be an impossible feat," he said. "This station was built a long time ago, so there's just a tank in the ground." On Tuesday night (Sept. 18), County Attorney Clifton "Skip" Patty said the proposal from KCP Architects was the most favorable proposal of the three received. "It is the recommended proposal for the architectural services," Patty said. "The fee for those services would be $31,650, which is 100 percent of the services quoted. This includes design, development, contract documents, bidding and evaluation, and contract administration." Commissioners unanimously approved the agreement, pending review of the contract by the county attorney's office. "We've looked at the proposed contract and it needs to be reviewed by the county attorney's office when it's submitted," Patty said. Two weeks ago, Camp explained that the project will probably cost in the neigh borhood of $1.2-$1.3 million. After the county approved nearly $725,000 worth of renovations to Station 3 in the Graysville area earlier this year, there's somewhere in the neighborhood of $1 million in allocated funds for upgrades to stations and facilities. Catoosa Commission Chairman Steven Henry (left) and others on the Board of Commissioners denied pro wrestler Paul Lee's request to rezone a piece of property along U.S. 41 from residential to commercial Tuesday night, Sept. 18. Catoosa County commissioners denied a zoning request from local businessman and pro wrestler Paul Lee Tuesday night, Sept. 18, halting his plan to build a storage facility along U.S. Highway 41. Lee's request included rezoning a parcel of land at the corner of U.S. 41 and Dogwood Lane as commercial so that he could erect a storage facility there. Prior to Tuesday night (Sept. 18), Zoning Director Jason Davis said the county's Planning and Zoning Commission unanimously denied the request last month. "The Planning Commission first met in regards to the case on June 26 and tabled the request due to the fact that Mr. Lee didn't have a detailed site plan," Davis explained. "Mr. Lee did present his case again to the Planning Commission at the Aug. 28 meeting. At the meeting, Mr. Lee presented two separate site plans to the commission and after hearing the case and reviewing the site plan, the Planning Commission chose to deny the case with a vote of 5-0 due to the fact that the comprehensive plan shows this area as a rural neighborhood and the C-1 designation doesn't fit with the surrounding areas." Lee argued a commercial business fits well on U.S. 41 and there wasn't public opposition at either of the Planning Commission meetings. "It's on the corner of U.S. 41 and Dogwood Lane, which is a dead-end street," Lee said. "Both times I came to the meeting, nobody from the community came or was against it. The main one I wanted was a mini-storage, which has only 30 units and would not be high traffic. U.S. 41 highway's long-term goal anyway is for everything to be commercial. I'm not trying to put it on some street. It's on Highway 41. I mean, you take your property, you pay your taxes, and you decide you want to do something with it." Commission Chairman Steven Henry said he visited the site earlier in the day and that his only issue is that residential property exists on both sides and behind Lee's eighth-of-an-acre lot. Lee said he planned on creating a 50-foot buffer on the property with trees and shrubbery that would cover it. Commissioner Jeff Long also pointed out the issue of Lee potentially being required to bring the road up to Georgia Department of Transportation commercial standards. Lee claimed that traffic wouldn't be a big issue at the property. "On a 30-unit mini-storage, it might be that some days it might not have nobody in there," Lee said. "There's a need for ministorage in the area because there's none there from Whitfield County to downtown Ringgold." Before the vote, Chairman Henry double-checked with Davis about what the county's comprehensive plan allows at the site. "The comp plan shows it as 'rural neighborhood', which allows for A-1, PCFD, R-A, and R-1 ... no commercial," Davis said. Ultimately, Commissioner Jeff Long motioned to deny the request, which passed with votes from three of the four commissioners present. Commissioner Jim Cutler was absent from the meeting and Bobby Winters didn't vote either way. Artist Greg Jackson holds fantasy portraits he painted of both his sons — his youngest son Evan as Spider-Man and his oldest Eric as Captain America. "Smoky the War Dog" is a painting Greg Jackson did based on a true story about a Yorkie in World War II. "Waco Red" won artist Greg Jackson an American Society of Aviation Artists award. Ringgold resident Greg Jackson started painting when he was a cadet at West Point. "I used acrylics," he says, "because they dried fast and I could throw my painting into a drawer and have my room in order for a surprise inspection." Cars were the earliest subjects of Jackson's paintings. One of his first portraits was of his used 1983 GT Mustang. He painted other cars based on magazine pictures. Thirty years down the road, Jackson says he has produced more paintings than he can recall — in both acrylic and oil. He specializes in aviation, automotive and historical topics, but he also does portraits of people and animals and has done numerous paintings on commission. Jackson is a member of the American Society of Aviation Artists and has won ASAA awards for seven of his paintings at International Aerospace Art Exhibitions. His painting "Waco Red," which depicts a plane he saw at the Military Aviation Museum in Virginia Beach, won the ASAA Nixon Galloway Golden Age of Aviation Award this year and was featured on the cover of ASAA's spring issue of "Aero Brush." By day, Jackson is a senior web graphics designer with a major insurance company, but he says painting and other creative endeavors are always on his mind. "It's a curse — in a good way. I feel the need to paint or draw or build things, to create." Recently Jackson has branched out to a type of painting he says he's really enjoying — customized fantasy portraits. He has painted his oldest son, Eric, as Captain America and his youngest, Evan, as Spider-Man and has done a self-portrait as a Roman Centurion. When a family friend wanted a portrait of herself as a mermaid — and not an ordinary one, but a warrior mermaid, Jackson was intent on a perfect portrayal. "I set up a 6-foot step ladder in my living room," says the artist, "and climbed up on it and had her stand below holding a sword in the air and took pictures. Then I put the pictures in Photoshop and worked with angles and lighting." Jackson incorporated many personalized elements into the painting. His subject loves whale sharks and octopuses, so instead of giving the mermaid a classic dolphin-type tail, he gave her a "fierce whale shark tail," and the centerpiece of the breastplate on her mermaid armor is an octopus. Jackson's works usually begin with a small sketch and advance to detailed outlines before he touches a brush to canvas. For planes, he gets a hold of blueprints and builds 3-D models on his computer that he can maneuver and study. From there, he creates a more complex composition. Only then does the painting begin. Some paintings, especially smaller ones, can take as little as a few hours to complete. Some get much more complicated. "Painting is a lot like golf," says Jackson. "When it's going well, you feel great about it. When it's not, when the ball isn't going where you want it to, it can be very frustrating." Jackson's painting "Purple Haze/Going Home" was a good example of the frustrating side of art. The painting depicts a fighter jet, escorted by jeeps and motorcycles trailing the purple smoke that was the signature color of the 510th Tactical Fighter Squadron during the Vietnam War. When he finished the acrylic, he stepped back and realized he hadn't achieved the effect he wanted. The solution, he decided, was to do it over in oils. He painted over the original until he was happy with it. Jackson has painted numerous dogs, but a favorite was a 4-pound Yorkie named Smoky. The dog was found in a foxhole in New Guinea in 1944 and was adopted by an Army Air Force corporal who shared his rations with her and took her along on combat missions and as a therapy dog to visit recovering soldiers in the South Pacific. Jackson used his own Yorkie as a model for the painting and portrayed the dog sitting in an Army helmet like the one her owner bathed her in overseas. Jackson loves painting while people watch and he loves to teach others to paint. He's set up easel and canvas at Rock City and in public places with other artists during conventions. Two years ago, he and others set up at Kalamazoo Air Zoo Aerospace and Science Museum in Michigan during ASAA's annual art exhibit and painted while visitors watched. Jackson believes creating is deeply ingrained in people as beings made in the image of God, "who is the ultimate creator."